Chess table has multifunction furniture in your house. You can put it indoor for chess game or as house decoration. You can also put it for your patio furniture or at backyard for having chess with your friends and neighbor. Completed with its stool make it so special and beautiful. 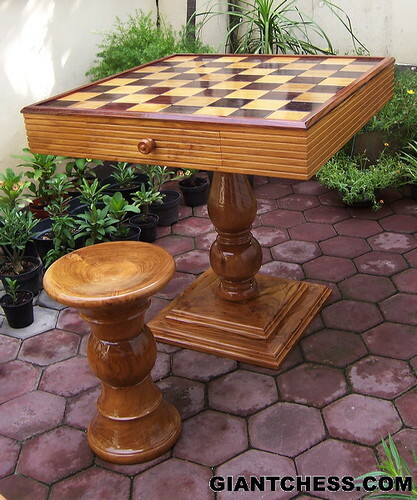 Enjoy you chess game with this kind of chess table and stool in your house. Sure that your guests will admire with your beautiful furniture. Those table and stool are made from Teak wood and carved carefully by our expert craftsman. Very durable for outdoor use and resistance in all weathers. You can left it at backyard for months. Those are polished well in brown or natural wood color and looks glossy. The table has two drawer for save your chess pieces, so that you can easy for use it anytime. Order now!